One of the six bags of straws Square Cafe collected during the past few weeks as part of Straw Forward. Jul. 20, 2018, 7:15 a.m.
More than a dozen local restaurants are trying to collect a million drinking straws through early fall so an artist can turn the ubiquitous plastic tubes into a public sculpture in Pittsburgh. “We just really saw this opportunity especially with all of the attention that’s being put toward plastic straws to create this pilot project to amplify the importance of reducing single-use straw waste,” Rebecca Bykoski, program manager of Sustainable Pittsburgh Restaurant, said about the Straw Forward initiative, which launched a few weeks ago. Sustainable Pittsburgh provided participating restaurants with signage, talking points, and receptacles to collect the straws. In some cases, staff will collect the straws in the dish station, and at more casual restaurants, customers may drop the straws into the receptacle themselves, as the initiative is meant to engage both restaurant employees and customers. Any kind of straw can be collected, from larger bubble tea straws to conventional fast food straws. They’ll be cleaned and sanitized before they become an artist’s medium. “The more variety of straws, the more interesting the art will be,” Bykoski said. Sustainable Pittsburgh may add additional collection points throughout the city for anybody to deposit their straws. Collection will continue through early fall, working toward collecting 1 million, which organizers know is a lofty goal. Disposable straws have been a hot topic this month with Seattle banning them and Starbucks pledging to cut straw use. 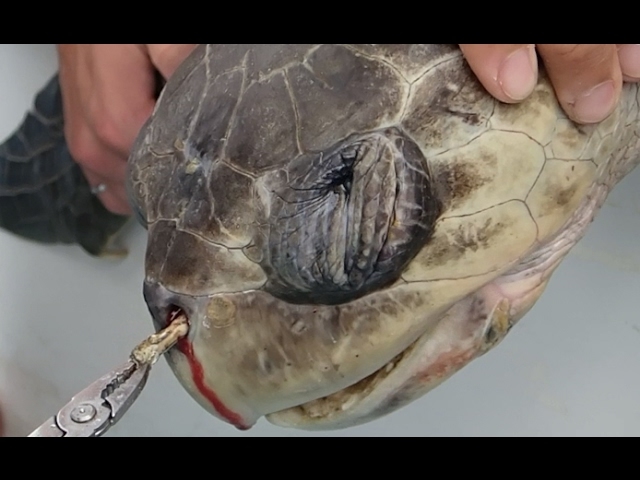 A viral, stomach-turning video from 2015 titled “Sea Turtle with Straw up its Nostril” sparked attention to the issue. Though critics say the focus on straws is misguided or distracts from bigger environmental problems, these facts still remain: Americans use hundreds of millions of plastic straws every day, per the Plastic Pollution Coalition. Straws are among the most common plastics cleaned from beaches, where animals often mistake them for food. Square Cafe signed on because “the plastic issue around the world is a big problem,” restaurant owner Sherree Goldstein said. “We just try to do the right thing.” The Regent Square restaurant has collected six bags of straws in the past few weeks. Two years ago, Square Cafe switched to an “ask first” straw policy, rather than plunking straws into everybody’s glasses. That’s reduced straw usage by 70 percent, Goldstein said. Even before the Straw Forward initiative launched, Sustainable Pittsburgh encouraged restaurants to asks guests if they’d like a straw or wait to provide a straw until a diner requests one, rather than automatically providing straws. “We’ve had really great success with over 60 percent of the restaurants in the program having adopted that approach,” Bykoski said, adding that restaurants may choose other alternatives such as stainless steel, bamboo, or paper straws. Have you seen the #StrawForward collections at participating @sustainable_pgh_restaurants? ♻️Silver designated The Apollo Cafe is one of over a dozen restaurants participating in the project! A #localartist will transform the collected plastic straws into a public display to promote awareness and then they'll be #upcycled appropriately afterwards. Learn more about the project via our bio link or at: http://sustainablepghrestaurants.org/site/straw-forward/ 💚Share your participation & help us spread awareness with #StrawForward! Local artist Eric Sloss is helping to design the vision for the sculpture, which will be on public display in Pittsburgh, though an exact location and opening date haven’t been determined. He sees Straw Forward as a way to engage people in “productive conversation about sustainability” and lead to more complicated discussions about plastics. Sloss plans to document where the straws came from, so people can track their straws. “Everybody collecting the art and participating in the art is just as important as the art itself — everybody that participates in it to know that they’re going to be a piece of this,” Sloss said. He was previously a principal partner and creative strategist at Shift Collaborative, the marketing agency helping Sustainable Pittsburgh with its communications efforts. So what happens after the artwork is taken off display? Sustainable Pittsburgh will work with Terracycle to turn the straws into a park bench. Overall, Bykoski wants the campaign to show how single-use plastics affect the environment. — Join in on Straw Forward. It’s open to any restaurant, not just Sustainable Pittsburgh restaurants. Email Rebecca Bykoski. — Patronize Sustainable Pittsburgh Restaurants. Do your research here to find out which restaurants focus on sustainability. — If you want to help with the art project, email Shift Collaborative. — If you’re out at one of these restaurants and happen to use a straw, make sure it goes into the collection bin and post about it on social media to help spread the message, Bykoski said. Updated: The art contact has been updated.